Looking at the big picture is certainly important when it comes to your transmission rebuilds -- the application, the diagnosis, and the rebuild process itself. But getting the small details right matters just as much, if not more, to the success of the service. In fact, the smallest parts you find inside your rebuild kit, no matter what type you use, can mean the difference between a satisfied customer and a comeback. When attention to detail is a trait that can set your business apart from your competitors, you can't afford to let the small parts slide. As with any automotive service, it can be easy to focus on the main components of your transmission rebuild jobs, but don't forget to evaluate the power of the small components, too. In this post, we'll explain how the smallest parts in your transmission rebuild kit make the biggest difference and why you should take the time to check them for quality. Depending on the application you're working on, the type of transmission, and other service factors, the smallest parts in your rebuild kit may vary from vehicle to vehicle. However, most rebuild kits contain most if not all of the following small components that can significantly affect the performance of the entire transmission. 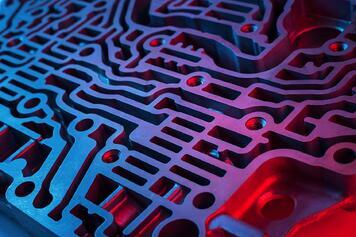 Inside the valve body of the transmission, there are different types of valves that direct fluid through the unit. One of those valves designs utilize a check ball, which allows or blocks fluid flow. Fluid pressure causes a check ball that sits in a pocket to block and unblock on orifice that fluid is flowing through or trying to flow through. This controls the timing and redirection of fluid flow. While the function of a check ball may seem fairly simple, a huge difference in quality exists depending on what material a check ball is made of. Steel check balls are prone to damaging the seats in the separator plate, causing incomplete sealing of the orifice in the plate over time. This can cause multiple problems, such as shifting issues, timing issues, and more depending on the affected oil circuit. On the other hand, elastomer or rubber check balls themselves wear down over time, resulting in poor fit to the orifices in the plate or, in extreme cases, complete blow through of the check ball through the orifice in the plate. In order to protect the check ball seats and ensure proper sealing, look for torlon check balls in your rebuild kits. Torlon is a high-performance thermoplastic that are formed and then hardened to resist high temperatures. The material is also highly impact resistant and is durable enough to last beyond the length of the rebuild. Transmission filters inside applications are critical to the operation of a vehicle in general. The function of a filter is to act as a sieve to remove dirt, debris, and contaminants from fluid as it moves through the system. Because fluid travels throughout the transmission and is responsible for a variety of functions, the quality of the fluid itself affects the entire system's operation. 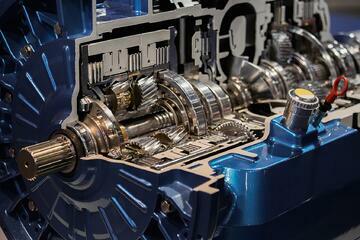 If your transmission filters fail, dirty fluid will contaminate the unit and can lead to a lack of hydraulic power. Some small filters that are extremely important to overall transmission performance are the valve body strainers. These small screens inside the valve body perform the function of a filter by minimizing the amount of small particles that enter oil circuits, affecting spool valves and solenoids. After a clean flush, replacing valve body strainers during a rebuild helps to keep debris and contaminants from hindering the transmission's performance. 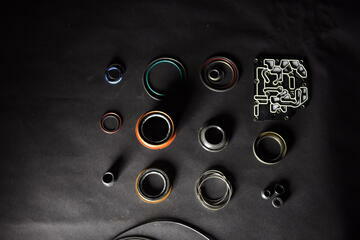 Perhaps the smallest rebuild components are the o-rings. The purpose of o-rings in a transmission application are to seal the unit against any leaks. These elastomer gaskets are shaped like a loop and are seated in a groove. They're designed for compression between two or more parts during the assembly (or in the case of a rebuild, the reassembly) of the unit, creating a complete, tight seal at the interface. In transmission applications, o-rings keep fluid and/or air from both escaping and entering the wrong oil channels, valves, or assemblies, especially at high pressure joints that are prone to leakage. The o-rings in your rebuild kit must be replaced during every reassembly, but it's also critical to monitor the quality of these small components. O-rings made of high performance materials (either the same as the OE components or better) will elongate the life of the rebuild and prevent comebacks to your shops in the event of transmission failure. In order for a transmission rebuild to perform to its highest potential (and if you're using the right parts, that should be the same potential as a new unit), every part has to meet a certain standard of quality, big or small. While we only listed a few examples here, you should recognize that all the of the small components matter. If the small parts can't do their job, it leads to bigger and bigger problems for the unit as a whole. When it comes to what's inside your rebuild kits, materials and design really do make all the difference, as well as having every single component you need for a complete rebuild. Skimping on quality or even emitting small parts all together are the way that low-quality kits cut costs, but those strategies come at the risk of your rebuild's success. Instead, find a true quality overhaul kit you can depend on. What's really critical for shop owners, technicians, and even drivers to understand is that it's truly never worth it to overlook the small details in order to get the service done quickly or cheaply. In order to provide the best rebuild service your shop is capable of, you must commit to putting attention and care into every part of the process — and that includes the little details.